The latest issue of Philosophical Transactions B looks at the opportunities for the use of human pluripotent stem cells (PSCs), both from embryos and from the reprogramming of adult cells, as a scalable alternative to using human tissue for bio- and regenerative medicine applications. These special cell types have the ability to change into different types of cells, which promises an unlimited supply of human somatic cells, allowing for precise modelling of human biology 'in a dish' and the possibility of novel cell based therapies for the clinic. We spoke with one of the Guest Editors, David Hay from the University of Edinburgh, about the issue. 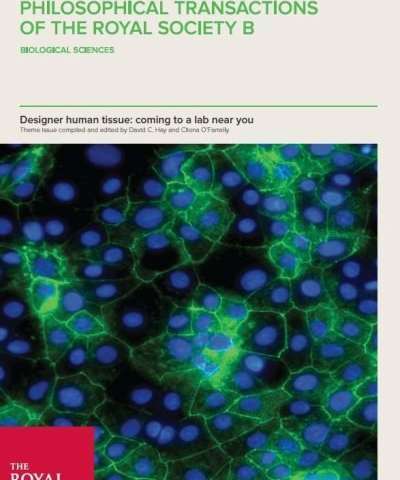 What do you mean by 'designer human tissue'? With recent scientific advances it is now possible to produce pluripotent stem cells from many human cell types, including blood and skin, and from anyone in the population. When coupled with an efficient differentiation method, pluripotent stem cells can form all the cell types found in the human body. Therefore, it is now possible for the modern researcher to custom build and design their tissue system of interest, from the desired genetic makeup for their particular study. The robust nature of these processes means that designer human tissue can be made with ease and at an acceptable cost for biomedical research. The next step is to use these systems to deliver game changing medicines and cell-based therapies for the clinic. Why do we need these new sorts of human models? The ability to generate renewable human tissue from defined genetics represents a source of personalised human tissue for use in the lab and the clinic 'in a dish'. We can use these systems to model human health and disease, with a view to improving our basic understanding and finding new treatment options. Additionally, we can fabricate models to understand the safety and efficacy of new drug based treatments and influence of genetic diversity across the human population. Going forward, these cells may also serve as an unlimited supply of human tissue that could be used to treat certain disease states and aid tissue regeneration during the aging process. What do you think is the most exciting potential application discussed in the papers in the issue? It is very exciting to think that we now have the ability to generate human tissue which approximates to that found in the human body. However, the development of these new technologies is challenging as well as exciting, requiring a truly interdisciplinary approach to research; drawing from biology, medicine, chemistry, physics, informatics, engineering, commercialisation and regulation. The papers featured in the special issue demonstrate the possibilities for this type of transdisciplinary research at this fascinating time in this complex new discipline. Going forward, what do you think are the greatest challenges that the field of regenerative medicine faces? Regenerative medicine aims to replace failing tissues or organs to restore normal function. The field is one of the faster growing medical markets. At present, tissue repair can be achieved through the use of drug treatments or the provision of a cell graft for a few diseases. The use of statins to manage atherosclerosis and stem cell transplants for leukaemia serve as good examples of mainstream treatments. In order to develop new regenerative therapies, for a multitude of degenerative or chronic diseases, it is essential that the drug or tissue generated is of high quality, safe and stable in nature. Central to these outputs are the development of in vitro engineered environments and tissue which closely mimic the human body. In addition to tissue fidelity, custom made tissue must be amenable to large scale manufacture at an acceptable cost. Going forward I believe that these are key considerations for the field which will be addressed through pioneering scientific research and interdisciplinary collaboration.